In the famous fairy tale, brother and sister, Hansel and Gretel overhear their parents planning to abandon them deep in the forest because they are eating too much food and the family is starving. Hansel and Gretel come up with a plan. They will leave a trail of pebbles that they can follow to find their way home. The plan worked and they found their way home many times but one day they couldn’t collect pebbles and used bread crumbs instead. The birds in the forest ate the bread crumbs leaving them hopelessly lost. There are many times that those of us with ADHD get hopelessly lost when we are working on long term projects because we fail to leave a clear trail. Short term projects, things that can be accomplished in a few hours are easier because if we can hyperfocus we can stick with it long enough to get it done. We run into trouble with long term projects such as writing a dissertation or term paper, organizing our papers, clearing clutter, renovating our homes or trying to find a new job. We start all kinds of projects yet have a hard time finishing because we fail to leave an adequate trail and struggle to begin again. Here are some suggestions for leaving a trail to help you finish what you start. Create a folder, file or clip board for the project. Create a to-do list and cross off the things you have accomplished every day. At the end of the day write yourself a note about where to begin again. If you are reading a book leave a book mark. If you are writing a paper leave yourself a note about the next point you want to make. If your project calls for supplies, create a shopping list. Be specific and make sure you will see this note so it is a clear visual reminder. These suggestions may seem hard to follow especially if you hate to write things down, have a poor sense of how you use your time, struggle to figure out what comes first and honestly believe that you will just remember what you need to do next. 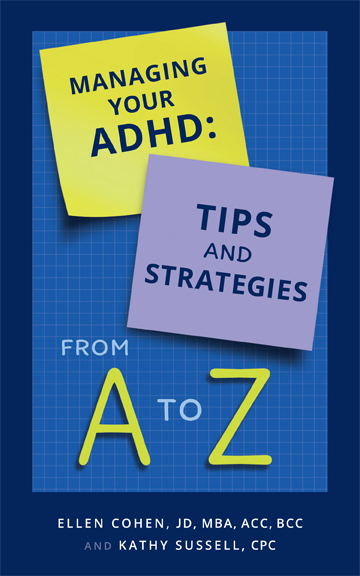 Planning for and completing long term projects is hard for everyone but especially difficult for people with ADHD. However, if you adopt just one of the strategies you will find it easier to complete long term projects.